I haven't had a seatrout yet this year. 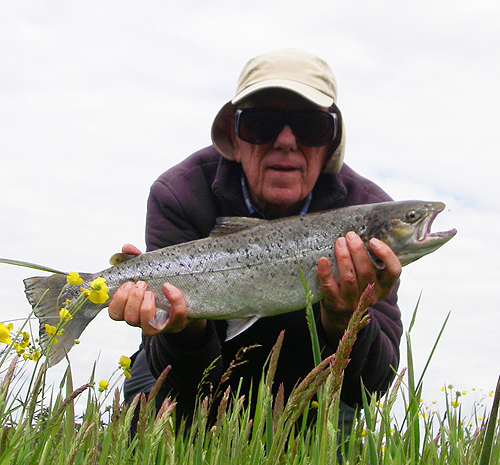 I've landed several fish which were very spotty and I would think were brownies up to a couple of pounds, but the nearest I came to my objective was last time out when I had a pluck and saw a big trout turn away from the lure. As I said in my last BLOG page I also had another follow from a slightly smaller fish but it didn't take. Anyway, after a busy morning in the garden and shopping , I decided to give the river an hour or so yesterday afternoon. I fished my little black and silver J9 Rapala (I've changed the hooks for 3x ones with a smaller one at the tail end) by casting upstream and retrieving just faster than the current. Fish have no bother catching the fast moving lure because they are also being pushed along by the current flow. 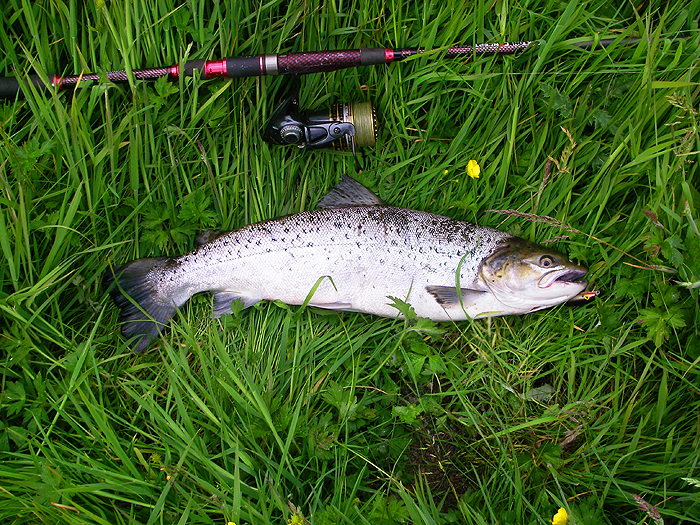 I fished for twenty minutes with nothing then I hooked a small (0.5kg) seatrout which wriggled a few times before coming unstuck. Encouraged I continued on upstream and five minutes later had a pull and a big boil on the far side of a shallow stretch but the fish failed to hook itself. I assume it was a decent seatrout but I'll never know for sure. Eventually I came to a two metre deep section on a bend and after a long upstream cast the lure stopped dead and a bout of head shaking showed that I'd hooked a good salmon which fought like stink and took me a very long time to subdue before I could beach it in the shallows to remove the hook. I rarely carry a net for this fishing because the lure tends to get tangled in the mesh and can seriously damage the mouth of a struggling fish. 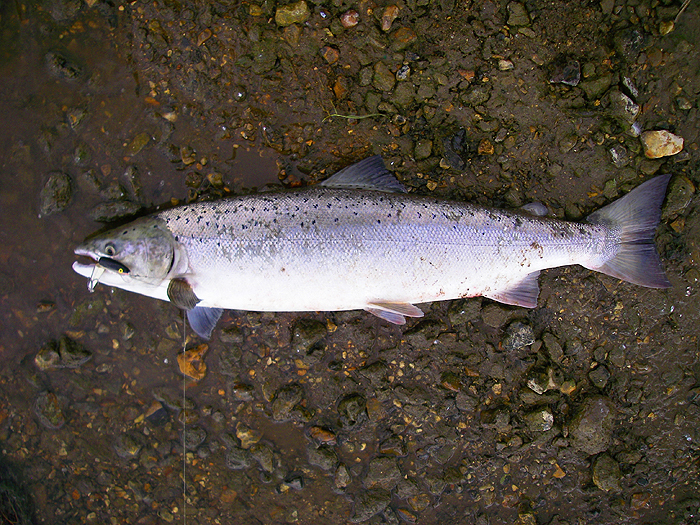 Anyway the salmon was as fresh as a daisy and weighed 7kg (about 15.5lb). I took a couple of pictures before reviving and releasing it. It soon swam away strongly. I was really chuffed with the salmon but still hankered after a seatrout so I plodded on upstream 'til I came almost to the top of the stretch. I cast up into the centre of the river (the strong breeze made it tricky to drop my casts hard up against the banks) and again I had a good take from a fish which turned out to be a 3kg seatrout. There were trees on the bank upstream of me and, an alder tree (too big to get the line over - I tried) downstream. The steep bank was a good metre high above deep water and as mentioned earlier I had no net - what to do? 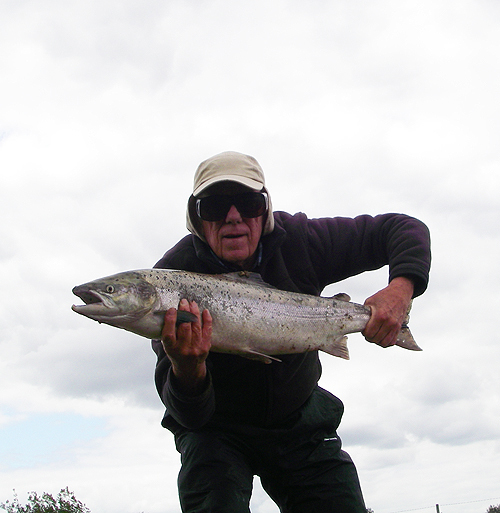 The fish didn't fight anywhere near as well as the salmon (seatrout are usually much livelier) but I couldn't lift it on the line without risking it tearing off or breaking the line. I took the heavy bag off my back (in case I plunged to my doom - I'd have trouble swimming even without it) and layed down on my belly. At full stretch I just managed to reach the fish and lift it without hooking myself. What a good session!